Natural Bridge Ha Ha Tonka. Real photo postcard, Published by Jas. Bruin, Linn Creek, MO. Unsent. Missouri has a lot of natural bridges. One of the largest is at Ha Ha Tonka Statte Park, spanning 60 feet and reaching more than 100 feet into the air. The tunnel through it is 70 feet long. It’s not only one of the larger ones in Missouri, it’s definitely the first one pictured. A crude woodcut of this arch appeared in The First and Second Annual Report of the Geological Survey of Missouri, G. C. Swallow, 1855. For a sense of scale, note the four people on the slope above the arch. Ha Ha Tonka, Mo. Can you identify this Mystery Image? 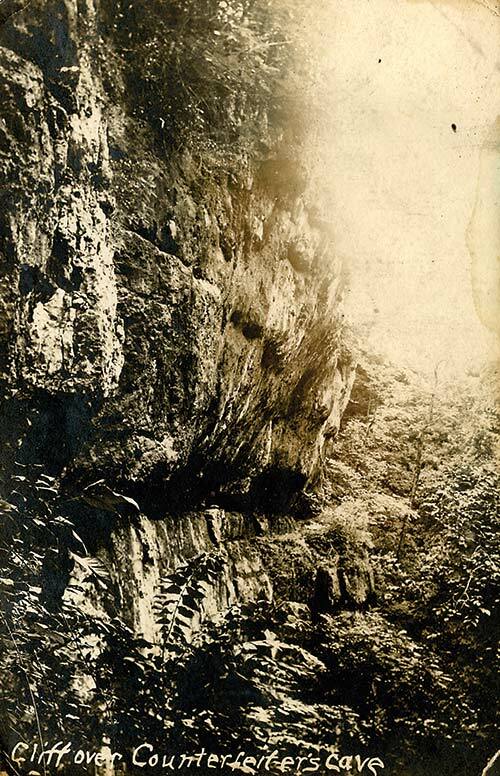 Real photo postcard, published by G. A. Moulder, Linn Creek, MO. Unsent. 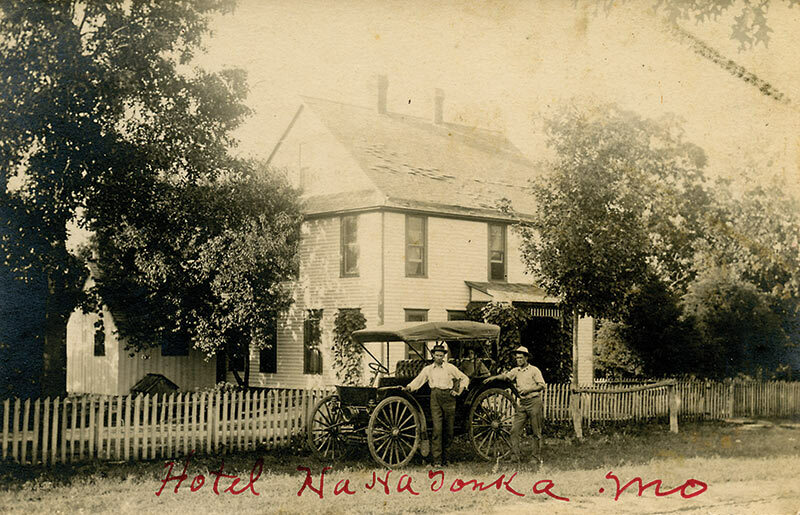 “Hahatonka, MO” pencilled on back. We’ve gone back and forth on whether these are ruins or some natural rock formations. Obviously, the castle didn’t burn until much later than when this card was published, which we estimate to be the 19-teens or ‘20s. Does anybody know what this represents? 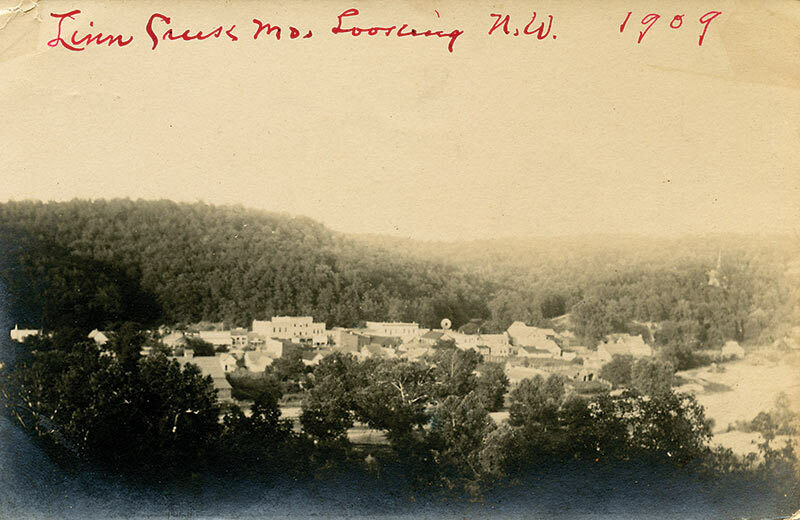 View of Linn Creek, Mo., written in white ink. Published by G. A. Moulder, Linn Creek, Mo. This appears to show high water on the Osage River and shows Linn Creek flooded to varying degrees. 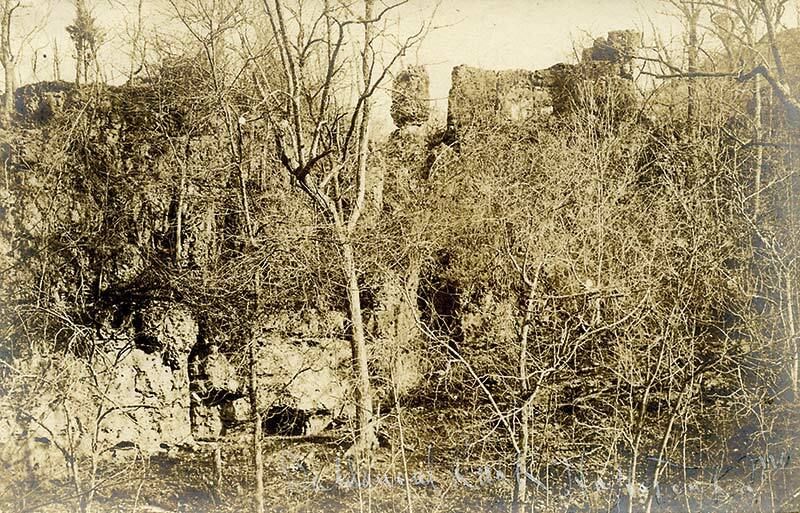 Linn Creek was built at the junction of the Niangua and the Osage and was subject to flooding. Its hardy citizens preferred occasional floods to being fifty feet under water. The town resisted the Bagnell Dam project and fought Union Electric tooth and claw. 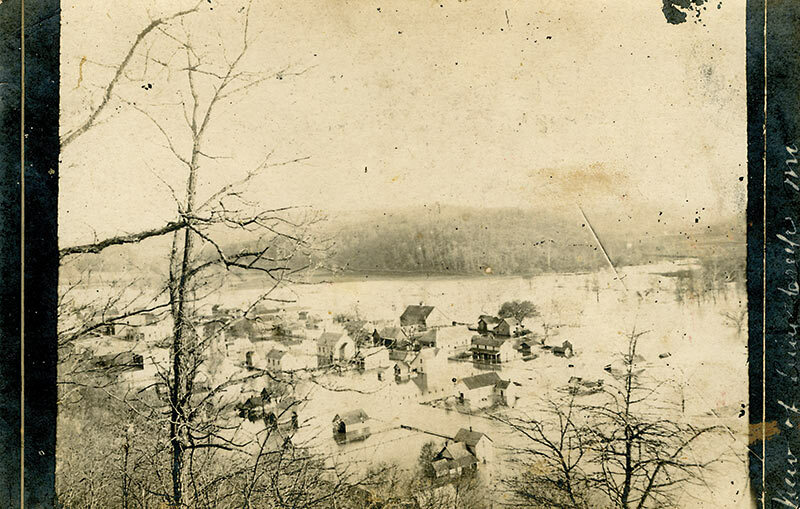 The little county seat of Camden County would go under forty feet of water twenty years after this photo was taken when Lake of the Ozarks pooled behind Bagnell Dam. Many of the houses would be moved, some were torn down, some burned – mostly foundations were left. Real photo postcard. No publisher. “Dr. Moore L. C. Mo.” is written in red ink. L.C. is Linn Creek Unsent. 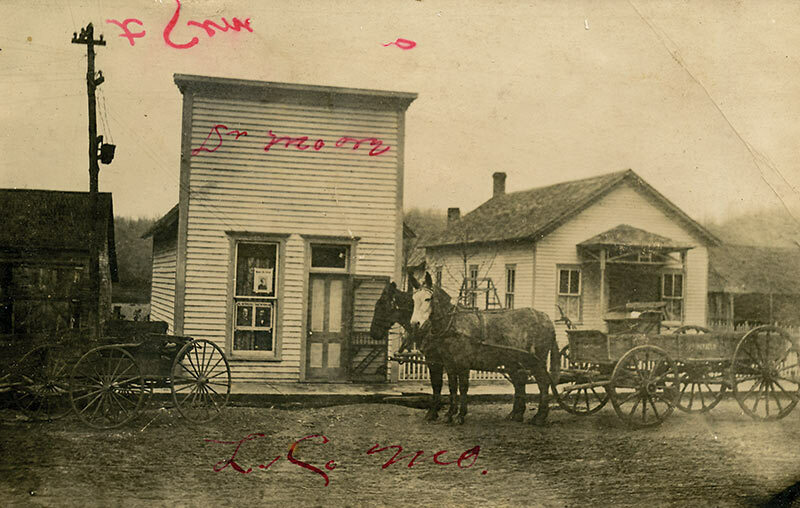 Penciled on back, “Linn Creek, Mo.” There appear to be some political advertisements pasted in the window. 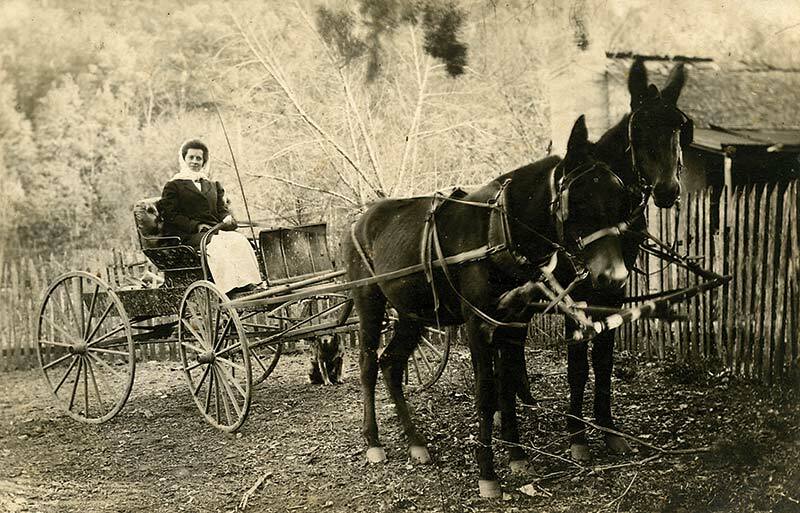 Shows a horse-drawn carriage, sans horses, and a farm wagon hitched to two mules. Someone really wanted others to know that this scene was in Linn Creek. It says so on the back and twice on the front. Linn Creek, the seat of Camden County, in spite of being subject to periodic inundation was a thriving little burg before Bagnell Dam. Linn Creek and Tuscumbia were the last towns to have regular steamboat service on the Osage. Does someone know who Dr. Moore was? The wild scenery at Ha Ha Tonka was appreciated by our ancestors. The walls of the collapsed cavern defied development so they look pretty much today like they did a hundred years ago. The story is (and it’s on most websites about Ha Ha Tonka) that a ring of counterfeiters operated out of this region in the 1830s. 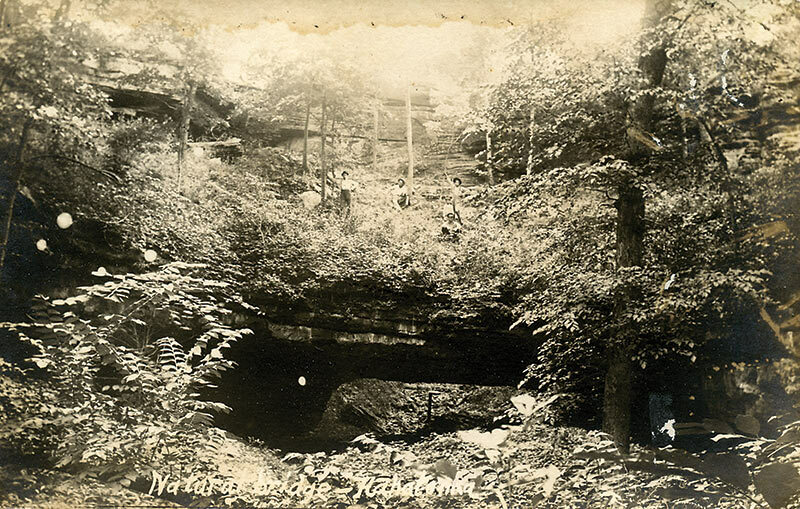 We don’t know if they used the cave or not but the name has been affixed to this cave, which is currently off limits at Ha Ha Tonka State Park. This is a real photo postcard, by Jas. 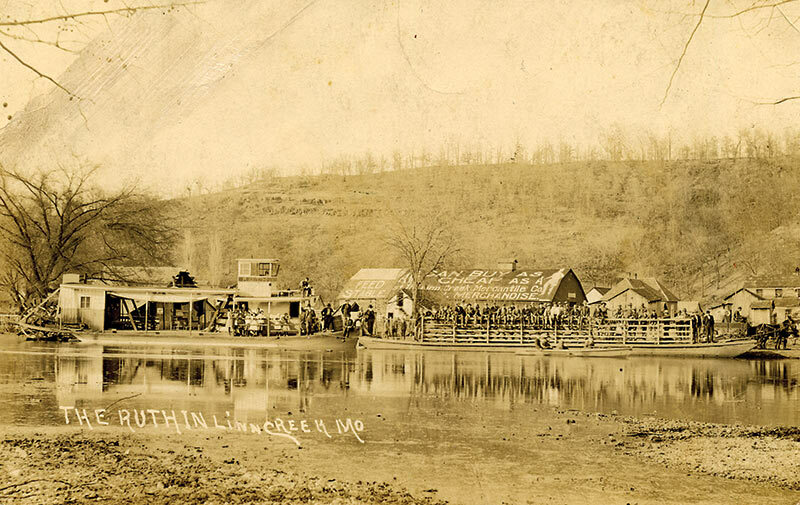 Bruin, Linn Creek, Mo., postmarked Linn Creek, 1910. It was mailed to Georgia Heaton, Joplin, MO. The penciled writing on the correspondence side of the card is too light to read. 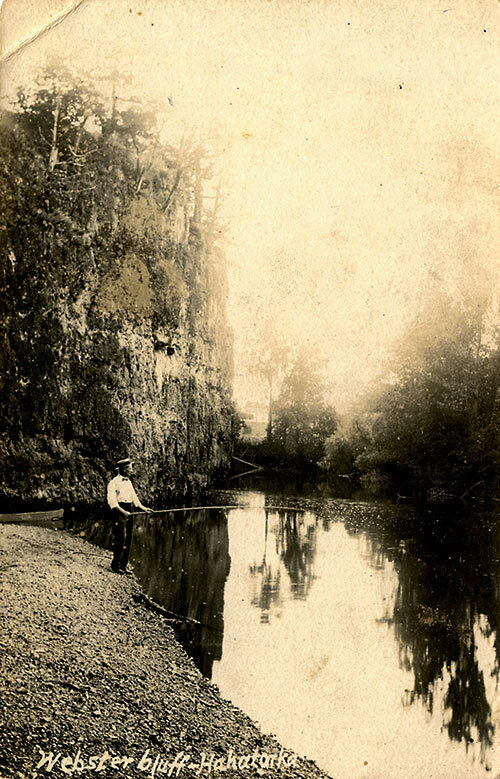 BTW – before the name Ha Ha Tonka, this area was called Gunter Spring, for John Gunter, an earlier landowner from Alabama. More on that later!